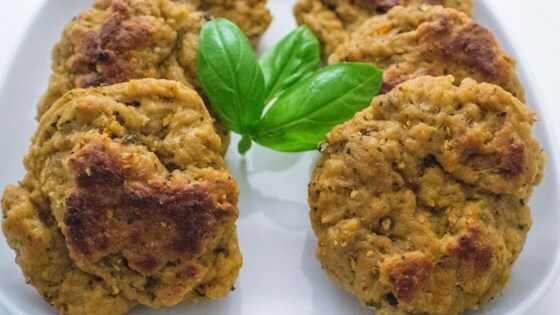 "I've used seitan for many things, from sandwiches to stir fries and this recipe is the best I have ever used." Stir vital wheat gluten, nutritional yeast, 1/2 cup vegetable broth, liquid amino acid, olive oil, and garlic in a bowl until ingredients come together into a ball. Knead ball until dough has a rubbery texture. Divide dough into 3 equal pieces and shape into 1/2-inch thick patties. Bring 4 cups vegetable broth, water, and tamari to a boil in a large pot. Carefully place patties into boiling broth; cover pot and return to a boil. Set lid slightly askew to vent steam and reduce heat to low. Continue simmering patties until firm, turning patties occasionally, about 1 hour. Remove pot from heat and set lid aside. Allow patties to cool in broth for 15 minutes before serving. This delicious lasagna recipe calls for a vegan tofu mixture instead of cheese. This will make roughly one pound of seitan. You can store seitan in an airtight container covered with the broth. Do not discard the broth though. It makes a SUPER rich soup base! The nutrition data for this recipe includes the full amount of the broth ingredients. The actual amount of the broth consumed will vary.